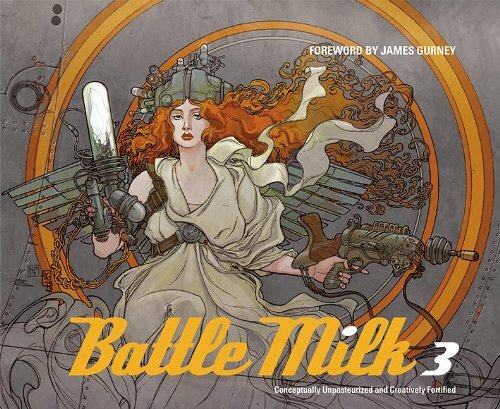 The first volume of Battle Milk was published in 2008. Back then, it was just an 80-page book featuring four artists. Next came Battle Milk 2 with 128 pages from six artists. Seems like the series is popular enough for a third volume. Again, pages are increased, this time to 160 pages. There are now nine artists, namely Christian Alzmann, Justin Ridge, Matt Gaser, Pat Presley, David Le Merrer, Thang Le, Kilian Plunkett, Le Tang and Jackson Sze. Battle Milk is a visual development art book. Each artist comes up with an idea or concept and brings that to life through visuals. Publisher Design Studio Press has published many such visual development art books. The stories are told with art. Thang Le reveals ancient temples hidden in mountains using his landscape paintings. Christian Alzmann presents a dark tale about a florist in search for a rare flower. Le Tang creates concept art for with circus as a theme. Other ideas include a kid who flew to the moon, a sci-fi tale of another Earth, a planet trillions or years old and inhabited by robots, a world with mythical creatures, weird photos from "Little Shutter Boy" and a dreamscape world. The illustrations are beautiful. Oddly enough, most of the stories use more of dark and muted colours. Each artist also talks about their creative process. Volume 3 is the best yet with more artists and work to admire.